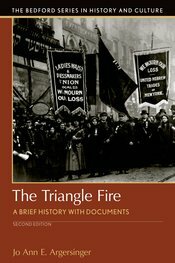 This new edition reflects and reinforces the continuing popular interest in the Triangle Fire of 1911. The Introduction provides critical context by exploring the demands industrialization placed upon urban working women, their fight to unionize, and the fire’s significance in the greater scope of labor reform. By adding new sources that elevate the voices of immigrant women workers as they organized to gain better working and living conditions, Jo Ann E. Argersinger challenges students to analyze the important political and economic roles held by these "factory girls." The diversity of sources helps to engage students as they explore the impact of a major event in a significant era of American history. Several pedagogical tools are also included to aid students’ understanding and analysis: headnotes preceding each document offer critical historical context; a chronology of the strike and fire is provided for historical reference; questions for consideration are designed to stimulate deeper analysis; and a bibliography with suggested sources and a list of relevant Web sites encourage further exploration of the topic.